The music of The Nutcracker by Russian composer P.I. Tchaikovsky is well known and has come to represent Christmas – we hear it repeated in many commercials or as mall background music. Yet when the music is linked with an entire performance of the classic ballet, it changes into pure magic. 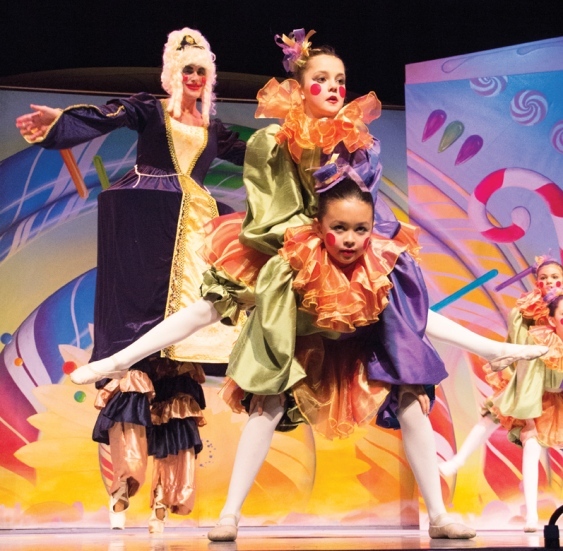 Coasting Along Theatre Society’s performance of The Nutcracker launched on Dec. 19 with a huge cast that included local aspiring dancers, professional guest artists, cool acrobatics, glittering scenes and enough dazzling pirouettes to make the head whirl. It’s a full-on production with two casts performing on alternating shows. But no dancer gets a rest between shows because they alternate roles. For example, in cast A on opening night, the part of Clara, the little girl who receives the gift of a nutcracker, was danced by Roxy Drewitz who flies in from Calgary for the role. In cast B, Coast dancer Jasmyn Evered plays the part, but during cast A Jasmyn takes on the dance of the Mirlitons (with Bronte Hansen and Diego Ramalho.) Eric Burrough was a dynamic nutcracker soldier in cast A, and he plays the Snow King in cast B – many challenging parts to learn for both casts. There are at least three versions of this ballet in Vancouver over the holidays, but I’m betting the Coast version would compare favourably. Among the many highlights was the committed performance of Erin McNeill as the Sugar Plum Fairy – she was born for the role – squired by her cavalier, Miguel Nguyen. The pas de deux from the Snow Queen and King, Ana Paula Oioli and Ramalho respectively, was graceful and classic. Some of the minor roles were outstanding: nine-year-old Trey Ingram defied gravity as the jack-in-the-box doll while Mother Ginger (Deryck Beckett) and her little Pulchinelles exhibited boundless energy. 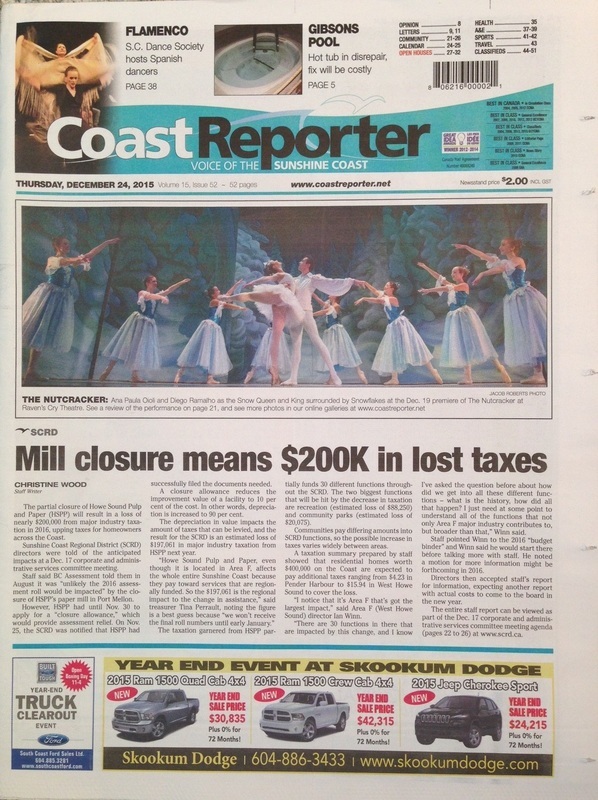 You had to love the Spanish dancers, and some of the Coast’s talented teens were excellent as dancing snowflakes. Kudos also go to the set design by Cody Chancellor and the costume design by Conchita Harding. 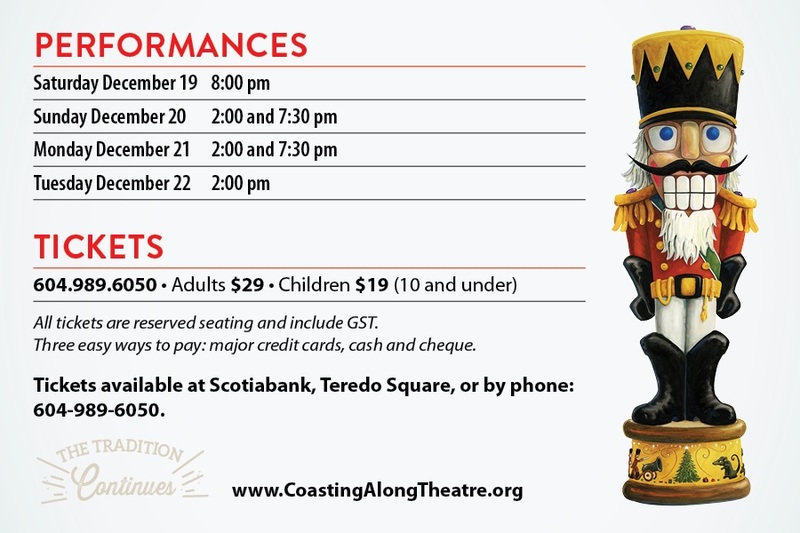 This is the fourth season for The Nutcracker that has become a labour of love for many. The colourful, official programme bristles with ads from small and large businesses that have embraced the idea and without whose contribution the expensive production would not be possible. 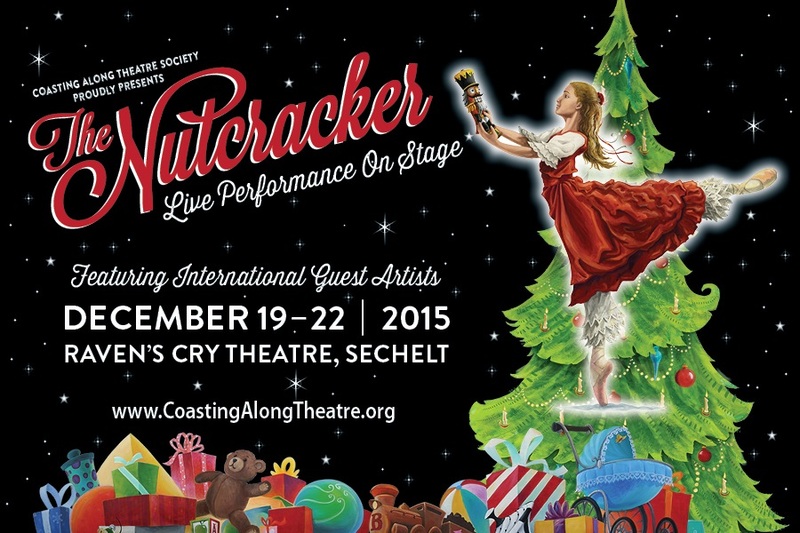 ​What The Nutcracker really has going for it is its artistic director, Kathleen Holmes. This is a year round organizing, fundraising and rehearsing job that Holmes and her late husband David Holmes began in 2012. The vision is realized every year.